This course was designed to expose the tax professional to a more complex level of tax return preparation. In addition to discussing adjustments to gross income, the course content will cover what constitutes self-employment income, the items which qualify as education in order to claim education credits, and guidelines for paying estimated tax payments. In addition, the course will briefly discuss deductible expenses related to work related travel and entertainment. Determine applicable adjustments to gross income (e.g., self-employed health insurance, self employment tax, student loan interest deduction, alimony paid, tuition, and fees deduction). Determine filing requirements (including extensions and amended returns). Identification of forgiveness of debt as income (including Form 1099-C Cancellation of Debt). 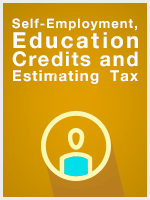 Self-employment tax adjustment to income (e.g., Schedule SE Self-Employment Tax). Tuition and fees - (e.g., Form 8917 Tuition and Fees Deduction, Form 1098T Tuition Statement). Education credits - (e.g., Form 8863 Education Credits (American Opportunity and Lifetime Learning Credits), Form 1098T Tuition Statement). Employee travel, transportation, education, and entertainment expenses - (e.g., Form 2106-EZ and Form 2106 Unreimbursed Employee Business Expenses). Understand estimated tax payment requirements (e.g., potential for penalties, Form 1040-ES Estimated Tax).